Found 6 file extension associations related to RatHole and 1 file format developed specifically for use with RatHole. 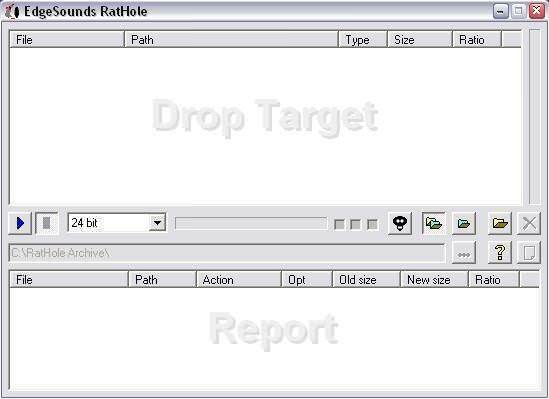 EdgeSounds' RatHole (former GenieSys RatHole) is a free unique nondestructive universal compression utility. Its function is based on a principle of self-training neural networks. EdgeSounds RatHole was especially designed for nondestructive compression of any files containing audio data in PCM 8/16/24 bit or IEEE_FLOAT 32 bit format. A new EdgeSounds compression algorithm makes it possible to efficiently reduce the size of packed audio data and later unpack exactly same bits, with no difference to the original data. The compression algorithm compresses audio data, considering the bit depth of the digital data contained in the audio file (8/16/24/32 bit). If you need more information please contact the developers of RatHole (Edge Sounds, LLC), or check out their product website.